At The Glass Half Full, we strive to be more than just your source for fine wine. We want to be an important and enjoyable part of your lifestyle. That’s why special events are a big part of the wine making experience that we provide to you. You can look to us for a wide variety of fun, educational and social events. 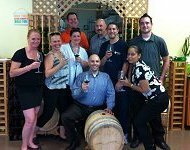 Have a great time with a group of friends or colleges at your very own Wine Making Party, hosted by The Glass Half Full. Enjoy a couple of hours sharing food and refreshments, and getting some wines started. Come back in a few weeks and bottle your creation! These events are ideal for groups of 4 to 12 people. Join us on our next wine tour. You’ll have a great time, make new friends and learn interesting facts about wine. 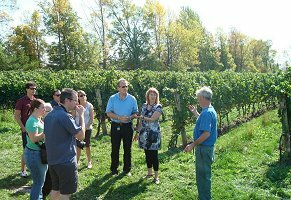 We regularly host organized tours to the best and most interesting wineries in the Niagara region, so contacts us today to learn about our next one. 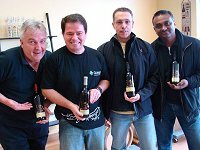 Want to learn how to taste wine or match wine with food? How about joining us for a book signing by an accredited wine writer? These are just some of the tasting and educational events that we host throughout the year. Whether your group consists of 10 people or 100, we can host a special event for you and your group. So contact us today, and begin experiencing wine making with a difference!